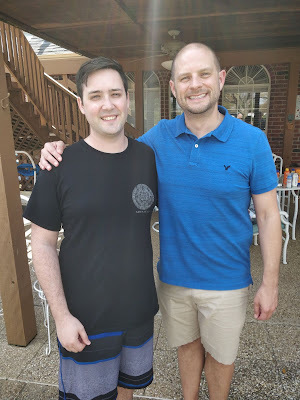 This past week I had the wonderful opportunity to baptize one of the guys I've been studying the Bible with for about a year. I met Pieter last March when he moved to the US from Belgium to get married to one of the girls in UTD FOCUS. Pieter's parents don't believe in God, so he was raised without any biblical teaching whatsoever. He met Marla, his now wife, online and they started having spiritual conversations. Over the internet, she taught him our Foundations of Faith study that we use with international students as well as much of Focus on Jesus. After Pieter decided he wanted to follow Jesus, they got engaged and he moved to Dallas a couple months before the wedding. Pieter and me after the baptism. I had already changed back, but the family was taking the opportunity to have a pool party! I got involved to help with pre-marital counseling and to officiate the wedding, but I quickly fell in love with Pieter. He has such a sweet spirit and is so eager to learn. Each week I would give him a book of the Bible to read (or multiple if they were short), and he consistently shows up having read it all and with a list of written questions for me! He's read well over half of the Bible at this point and we're still going strong! He's been thinking through baptism for the past couple months, but he wanted to wait until his sweet parents would be in Dallas so they could be a part of it and see the gospel in action. Don't Forget about Spring Showcase! 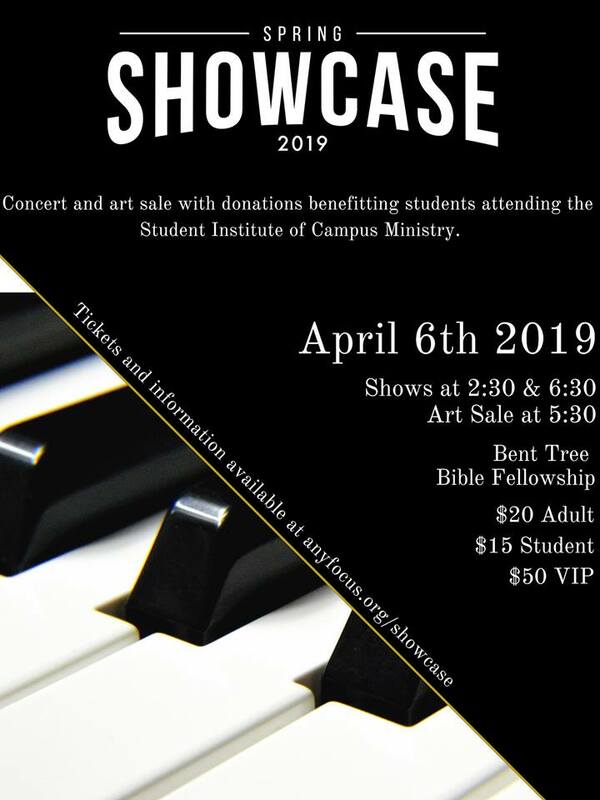 Spring Showcase on April 6! If you are looking for a low-cost-high-impact way of investing in God's kingdom on college campuses, this is it! Coming up in less than 2 weeks, this is an amazing show every year. It's $20 for adults, $15 for students. OR, for a very special VIP experience, there are a limited number of $50 tickets available. 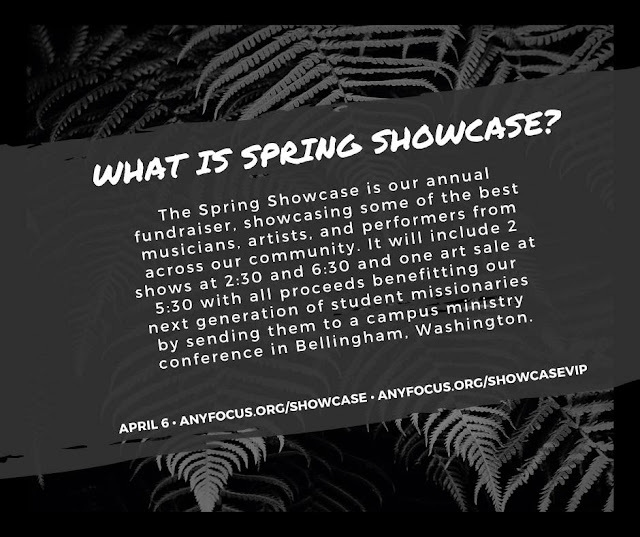 There will also be art and various artisanal goods for sale in between the shows. Everything is to defray the cost of sending about 110 young students with high leadership potential on 2 separate SICM trips this year in May and June. This is where they catch the vision and come back ready and eager to missionaries to their peers until they graduate. There's no more strategic thing that we do! Over 17 years, SICM has proven its worth over and over. I hope you and your family can make it! It will be a wonderful afternoon or evening of entertainment. If you can't make it, you're always welcome to give a little toward SICM scholarships as well. 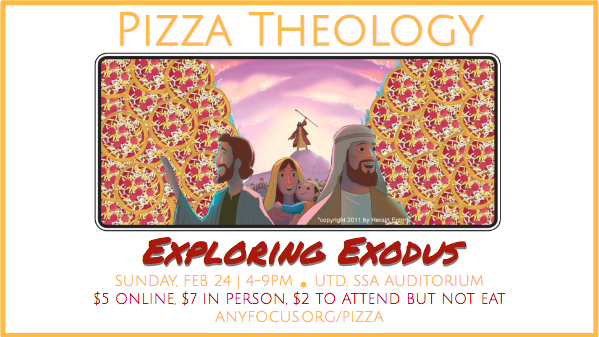 In late February, we put on our most recent Pizza Theology event. About 450 students came out to hear 4 hours of teaching on "Exploring Exodus." Some of our staff members taught it, and they spent so much time researching and learning themselves in order to share something that would bless our community. The goal was not just to gain insight into the book of Exodus, but to frame and shape the way we read Scripture as a whole, and the Old Testament in particular. You can find the audio, along with the slides and handout, here. Creatively working pizza's into the theme advertisements is a Pizza Theology staple. Last week at our UTD Friday Night Fellowship meeting, one of the students shared this vision with our community, and I think it captures why we put so much time and energy into events like Pizza Theology. You would have been so encouraged to see him stand in front of everyone and share this humble and powerful message. "When I came to college I had an extremely simplistic view of Scripture, if even that (basically, what you could learn from a Children’s Bible). Also, I had this idea ingrained in my head that God was this distant, foreign entity that was so complex that any attempt to try to understand Him was pointless. 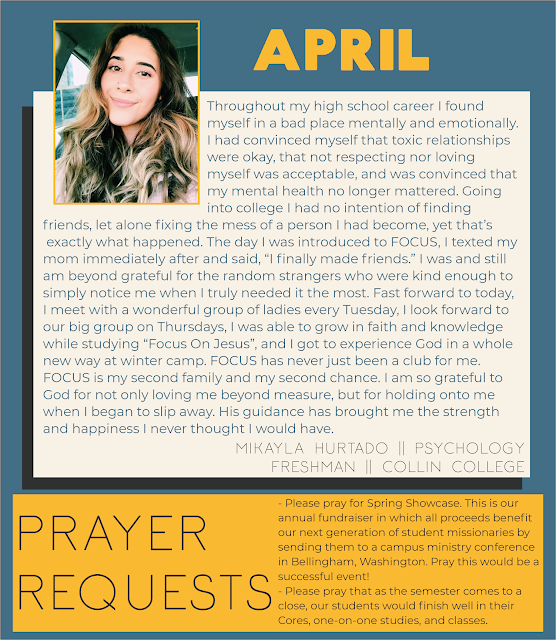 As I started to get plugged into FOCUS, my views on seeking God intellectually changed, but I still held onto this idea that because I was never going to fully understand God that I shouldn’t put in my full effort to seek him intellectually. But I remember one of the staff members speaking at an FNF, and they said that Christians should have a knowledge of God at least at the level of their academic education. That is to say, if you are a college student, which we essentially all are, you should not settle for a middle school or high school level understanding of Scripture. I remember hearing that and feeling quite convicted, not only because I did not have a college level understanding of Scripture (I still don’t have a college level understanding of Scripture) but because I had placed the bar so low for myself in my pursuit of knowledge of God. The fact that I had such high expectations for myself in my academics and failed to do so in my walk with God showed me that I really needed to reorganize my priorities. Matthew 22:37 says “Jesus replied: "'Love the Lord your God with all your heart and with all your soul and with all your mind. '” So, I’d come to realize that even though I may not know all of the answers to the questions people have been asking for ages about God, I should still keep seeking, so that I can love God with all of my mind. And, this idea of pursuing God intellectually is a huge part of FOCUS’s vision, that we would be a community that not only loves God with our hearts and souls but also with our minds. I’d encourage all of you to find a way to invest your time to seek God intellectually, (through researching Scripture, reading commentaries, listening to podcasts, etc. ), because if we were to be more intentional about that, I think it would be honoring to God." After many years of building momentum as a branch of the UTD ministry, our Richland ministry is off and running on its own. Some neat young leaders like Evan have made that possible. Evan is so personally kind and affectionate and encouraging toward me every time I see him. 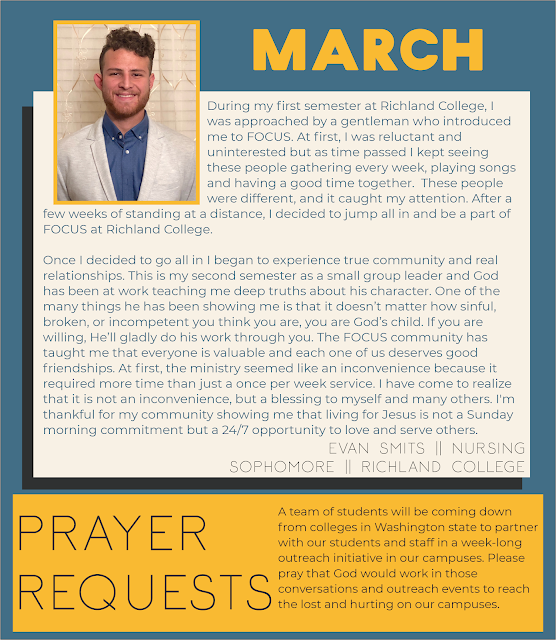 It makes me excited to think of him spending time with young men at Richland College each week! 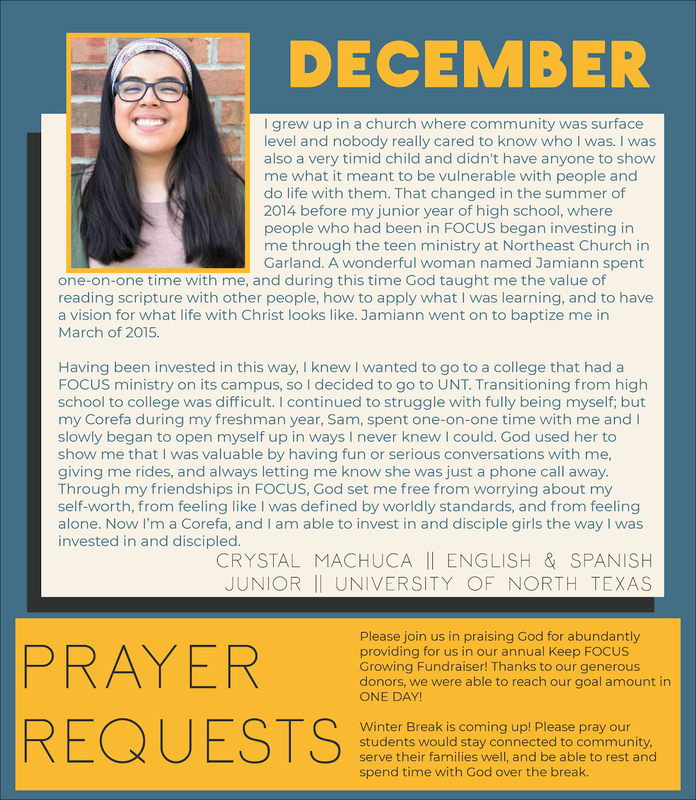 Thanks for your ongoing love, encouragement, financial support, prayers, and example! I'm very blessed to be a blessing to the campus on your behalf. 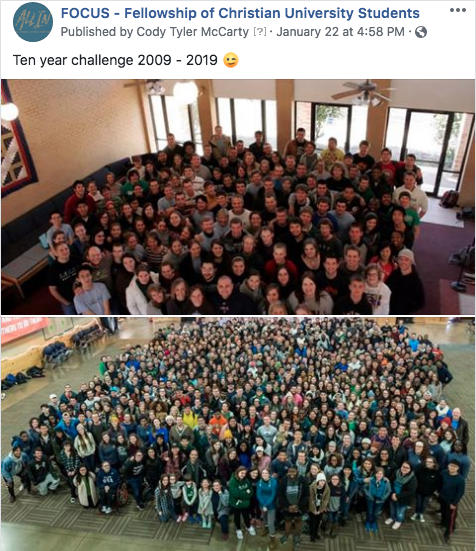 With the ten-year challenge trend floating around on social media, some of you may have noticed this post on our Facebook page. It's encouraging to the see the growth, and it's clear God has done so much in our little corner of his kingdom! But growth alone doesn't really tell us much. I teach a class to our apprentices that we call Strategic Leadership. It gives me a chance to share things I learned in my graduate degree in strategic management and how those things intersect with ministry leadership. We have some great discussions! Today we were talking about the ideas of effectiveness and efficiency. Efficiency can be a wonderful thing. We find ways to minimize the waste of time and money and other resources. It can help churches and nonprofits carefully steward donations, help us all care for the world we live in, and help us maximize the time and money we have leftover when our work is done. But efficiency has a dark side when it isn't sought in the service of true effectiveness. If we forget our original goals, the things we want to be truly effective at, efficiency can become a goal in itself. We've all been victimized, right? A favorite product suddenly isn't very good quality anymore when the manufacturer starts cutting corners to save money. A store that once had great service gets rid of half their employees and service suffers. You know the drill. So when I look at our ten-year challenge photos, it raises the question in my mind, "what have we given up in the name of growth?" As I reflect, I am confident that we haven't sacrificed effectiveness in our calling on the altar of efficiency. We still try to study the scriptures one-on-one with every student who will agree to it, and most of those studies take 6 to 12 months to complete. We still invest about 120 hours per school year of teaching and personal coaching into every student that steps up to lead a core. We still celebrate real, meaningful friendships as the best context to live out the gospel on campus. Our Winter Camp speaker, John Stackhouse, asked a lot of questions about how the FOCUS community approaches faith and ministry. His response (which was very complimentary) began with something like "How very inefficient. It sounds biblical!" I don't think it's actually inefficient. I think it's as efficient as we know how to make it (so far!) while still being effective at making and maturing disciples to God's glory. We haven't let go of that mission in the name of growth. I'm confident that we are BETTER at it today than we were 10 years ago. We have a better understanding of the gospel to share with students who need to hear good news. We are better at developing young leaders for God's kingdom and giving them the skills to succeed both in and beyond college. We are better at equipping young people to have real, meaningful relationships in an increasingly disconnected culture. I'm excited about the next 10 years, and my prayer is that we will always be efficient enough as good stewards as we pursue maximum effectiveness in what the Lord has actually called us to! John Stackhouse (more info on him here), our Winter Camp speaker this year, did an amazing job communicating about the faith to our students. He's a top theologian who has been on ABC and NBC News, been interviewed by the New York Times, and has lectured at Harvard, Yale, and Stanford. But his humor and wit and ability to clearly explain things broke through the students' expectations of what a theologian would be like! (aka boring) He also pushed their buttons and challenged their thinking on many things. Lots of great conversations are still happening as they process the weekend in community. He did five talks and two 1.5-hour Q&A sessions. If you'd like to listen, they're up on our website. Thanks for your support in realizing this vision. Here's to whatever the picture will look like in 2029! As ministers, we don't have a magic exemption from this challenge. As I talk to the campus pastors on my team, I hear mostly the same middle-class American anxieties and worries that our peers and our students are expressing. We want to be well off and comfortable. We want rights and security. We often find true sacrifice and real suffering out of reach. 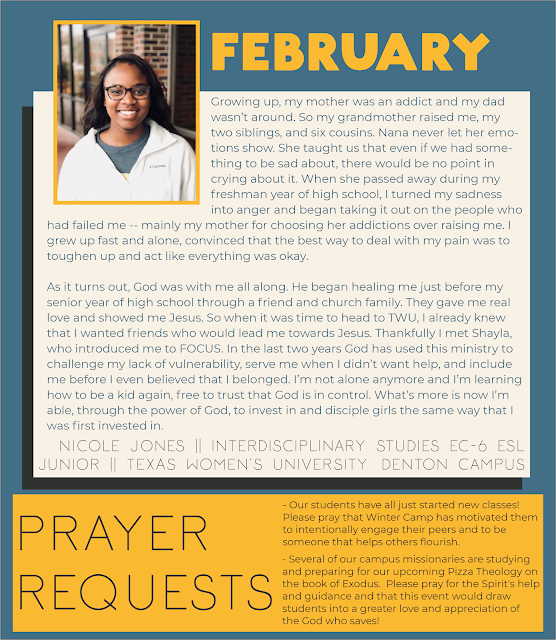 Each January, we prepare for the return of the students by retreating together as a staff to reflect and encourage one another. This year, we each read the Narrative of the Life of Frederick Douglass in preparation. It was a chance to gain some perspective from a different time and situation. If you aren't familiar, Frederick Douglass was born a slave in the American South. He lived in slavery for over 20 years before escaping and becoming a prominent abolitionist leading up to the Civil War. He was a Christian, but he was also enslaved by those calling themselves Christians, and so he became a prophetic voice that still speaks today. He wrote, "I assert most unhesitatingly, that the religion of the south is a mere covering for the most horrid crimes, a justifier of the most appalling barbarity, a sanctifier of the most hateful frauds, and a dark shelter under which the darkest, foulest, grossest, and most infernal deeds of slaveholders find the strongest protection. Were I to be again reduced to the chains of slavery, next to that enslavement, I should regard being the slave of a religious master the greatest calamity that could befall me. For of all slaveholders with whom I have ever met, religious slaveholders are the worst. I have ever found them the meanest and basest, the most cruel and cowardly, of all others." He exposed the hypocrisy of the church, a church that was all too often either silent or complicit in slavery. "Between the Christianity of this land, and the Christianity of Christ, I recognize the widest possible difference," and "they are always ready to sacrifice, but seldom to show mercy." As a staff, we reflected on what our own blind spots might be and whether repentance is in order. We reflected on men and women like Douglass who truly suffered for doing what was right, and how different their suffering is from what most of us experience. We also spent time pondering and discussiong a number of scriptures that speak to our attitude and perspective on the difficulties and suffering we do face. James says, "Consider it pure joy, my brothers and sisters, whenever you face trials of many kinds, because you know that the testing of your faith produces perseverance. Let perseverance finish its work so that you may be mature and complete, not lacking anything" (James 1:2-4). Paul writes "we also glory in our sufferings, because we know that suffering produces perseverance; perseverance, character; and character, hope" (Rom 5:3-4). And in Hebrews, "Endure hardship as discipline; God is treating you as his children... If you are not disciplined—and everyone undergoes discipline—then you are not legitimate, not true sons and daughters at all... but God disciplines us for our good, in order that we may share in his holiness. No discipline seems pleasant at the time, but painful. Later on, however, it produces a harvest of righteousness and peace for those who have been trained by it" (12:7-11). These and others tell us that some of what God wants to do in us is only accomplished through pain and not comfort, calling into question how diligent we are in trying to create comfort and avoid pain in our day to day lives. Suffering is integral to the Christian life. It's a part of our identity as people who follow and imitate a suffering Messiah. This is something we as pastors want to do a better job of communicating to our community and to ourselves. 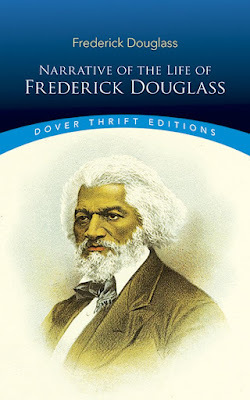 I highly recommend reading Frederick Douglass' book if you haven't before (or maybe haven't read it since high school :). I know this older brother in the faith would minister to you as well. Tim is such a neat young man. He's someone I've had the privilege of spending some time with along the way, and I've watched him take his stand on the gospel, willing to pay whatever it costs. Like so many others, he has a strong Christian heritage from his parents, but at the university, he's had to choose Jesus and get to know him for himself. Thank you for supporting and praying for the mission to reach college students like Tim. Great things are happening! is also an apprentice this year. "One week while we were doing Questions on Display a couple of Muslim students came up and started talking to a couple of our students about how Islam and Christianity compare. It was incredibly encouraging, they were so respectful and just wanted to start a dialogue with us. I got the opportunity to talk with a student named Irslan. He had spent a whole year reading through and memorizing the Quran, so he knew his stuff and was very passionate. But he loved that we were doing outreach and starting conversations about religion on campus. I was able to talk to him about Jesus and what his conceptions of Christ were as compared to what Christians think. Overall it was just so encouraging to have an open and friendly dialogue with people who were not yet Christian, but loved to talk about and explore different ideas. Irslan ended up asking me for my number so that we could hang out and talk more later! God is really opening up opportunities to reach out to these Muslim students!" The team has been doing creative things and the students are coming out in force to share their faith. On the left, some of our team are standing in front of "Questions on Display" where we engage students with spiritual questions. On the right, students are sitting at "Story Time," an event where they told compelling stories (including some of Jesus' parables), and students sat around and discussed after each one. "This month, all of the UTD apprentices went over to the TWU Dallas campus to put on a Christmas event for the students there. TWU Dallas is typically very different than some of our other campuses. The average age is much higher, there aren't nearly as many students, its confined to basically one building, and there aren't many events that happen on campus. So the fact that we were throwing this event and reaching out to people was already a big shift from what seems like the norm on this campus. The event was simple, we were giving out free hot chocolate, coffee, candy, and cookies. Based on the reaction of the students though, we could have been giving away cars. They were just so blown away that an organization would put on something like that. So many of them shared that our little event made their whole day. Plus, our students had the opportunity to engage in spiritual conversations with them while decorating cookies! It was so encouraging to see how far even a little effort can go to spreading the love of Jesus on campuses like that." 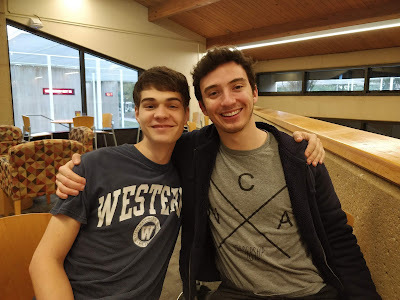 One other cool story is that through these outreach events, a number of our staff and students have connected with members of the atheist club on campus, including some of the leaders. Meaningful friendships have been formed that have resulted in some of them consistently attending our Tuesday night fellowship meeting and also inviting a couple of our staff team to come and speak at their weekly meeting. Please pray for God's blessings on all involved. Keep FOCUS Growing Fundraiser Thank You! Our exciting news is that we exceeded our goal for KFG! We blew past our matching funds goal of $29,000 on Giving Tuesday and the students exceeded their matching funds goal of $5000 at our weekly fellowship meetings that week! In all, we are over $75,000 which puts us in a great position moving into the next year. Thank you, thank you, thank you to all of you who gave, shared the posts or otherwise passed on the news, and prayed for us. I was blown away by your generosity! 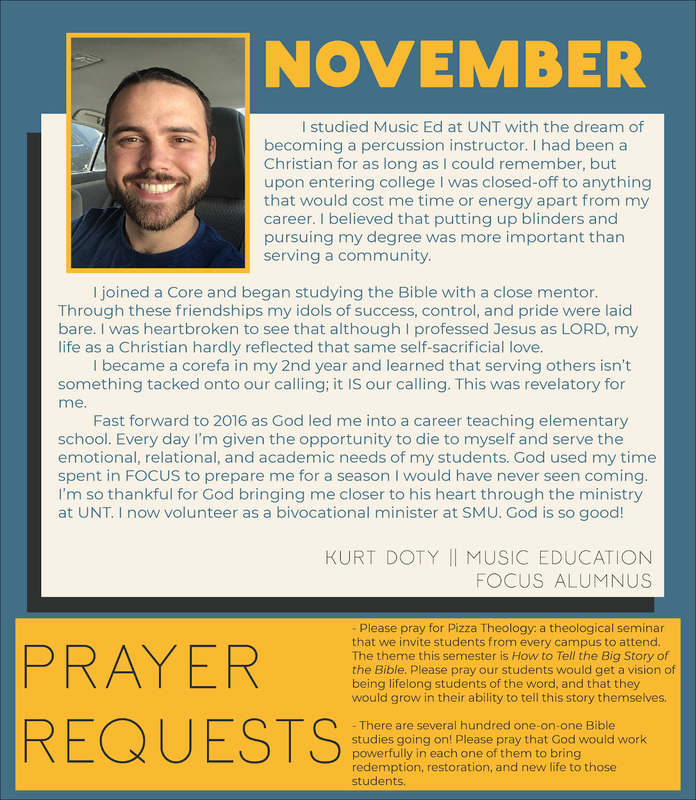 I've been thinking quite a bit lately about the future of our mission to the campuses in DFW. There are a number of challenges ahead, but none more important than getting the right leaders in place. Each of our staff missionaries commits for 1-5 years at a time. This brings a lot of stability, which is important to the students, and it's rare that someone has to step out unexpectedly or in the middle of a school year. But it also means that in certain years, a lot of key staff members are considering whether to stay on at the same time. This is one of those years, especially among our women. I get to work with some amazingly gifted women who use their gifts in powerful ways. My hope is to keep them on staff for a long time! Yet as our staff has gotten a bit older, our women are being pulled in multiple directions. Some are feeling the pull toward not working outside the home in a formal way to provide maximum flexibility to invest in their own kids. That will affect more and more of them in the next few years. Others are feeling pulled to invest more heavily where they see gaps in the women's ministries at their churches, knowing their experience could be very helpful and that they would enjoy working among peers. And, as our staff members get married (often to each other! ), we have less flexibility to fill key needs across the Metroplex. I know God will provide all that we need. Please, be praying for clarity and wisdom as we do our best to both plan well for the future and also to be obedient and responsive as God does things we haven't planned for! I've been so impressed by these guys. They are thoughtful and purposeful and careful in their leadership. They're open and honest and bring great questions to our meetings. I've known William basically since he was born, and it's a joy to have him at UTD. In addition to leading core, he is the worship leader for our new Tuesday evening service. 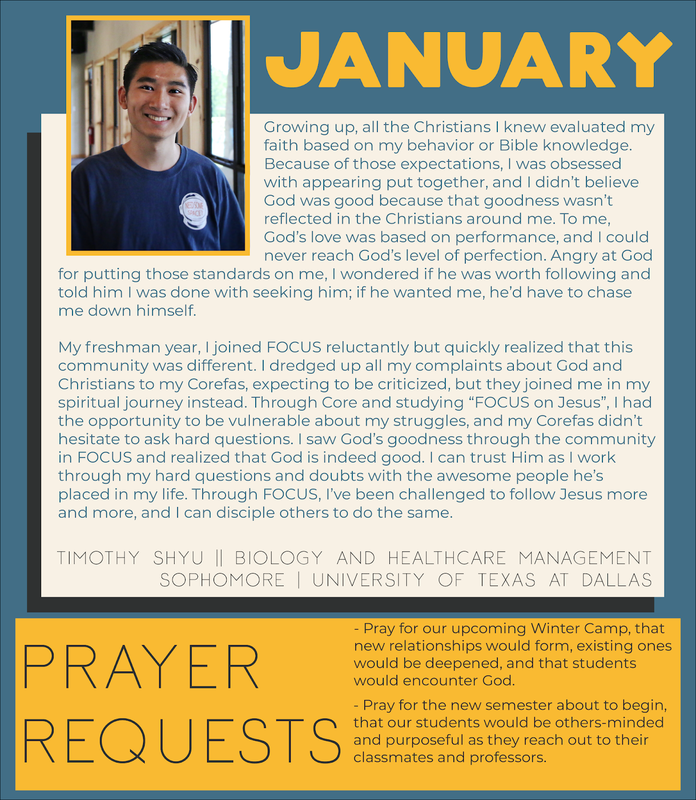 Mark came in as a freshman a little over 3 years ago not seeing himself as a leader, but God had bigger plans! Mark served as our organization president last year, and as a senior this year is setting the pace for our entire leader team. Mark on the left and William on the right. Please say a prayer for these young ministers! I hope for my time with them to bless their lives far beyond this school year. This month, I have a story from an alumnus. He's the youngest sibling from a set of three who were all leaders in FOCUS during their time in college. The legacy of faith from the Doty family is still growing!